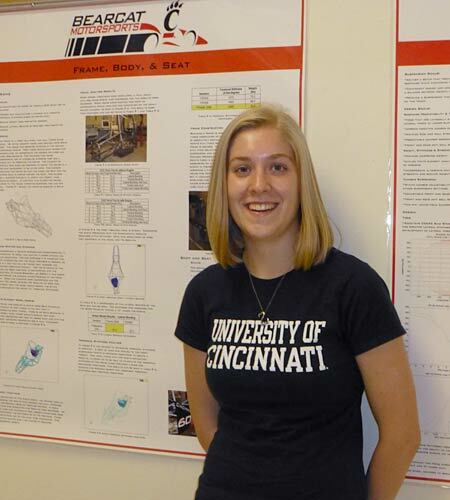 Lauren Schultz is going into her third year of studies in mechanical engineering at the University of Cincinnati (UC). She has yet to experience overt sexism in her program — nobody has told her she should change majors — but there are subtle indications of what she already knows: Some STEM fields are predominantly male. "It is kind of intimidating when you walk into a class and you're the only girl in it," Schultz says. "It's not like people are saying, 'You can't be here,' but there is something a little bit intimidating about that. "My dad's a chemical engineer and he encouraged me to go into engineering. He told me from the beginning there aren't many girls, but that I could do it." Like many colleges and universities, UC has few programs that actively recruit, retain, and assist women in STEM fields. Even though women make up 55 percent of the U.S. population, some STEM programs, such as engineering, are considered doing well if 15-16 percent of their student population is female. The school has a few extracurricular technology resources — Anita Borg Institute for Women and Technology, Society of Women Engineers, and Women in Technology International — but no formal programs specifically designed to bring women into engineering or other STEM fields and help them succeed. Each college within the university must develop its own initiatives. One of the few opportunities at UC is WISE, Women in Science and Engineering, which offers a summer research fellowship for undergraduate students. The Research Experience for Women Undergraduates (REWU) is a 12-week summer program that pairs student applicants with mentors and their current research projects. The faculty members hire and guide the efforts of the students, and the students are expected to work in the lab to gain as much experience as possible. The students receive a $4,000 stipend provided by UC and the individual faculty members/mentors who will hire them. Because of limited funding, only a handful of potential participants are accepted. "One of the unwritten expectations is that once the student and the mentor have that 12 weeks ... hopefully they have found it to be positive, not just personally but professionally, so that the mentor will take the mentee on for continued research in their lab," says Urmila Ghia, REWU chair. "That has happened so many times." In addition, students in REWU are prohibited from taking classes or other employment during the summer term, and each student must present a paper about her experience and attend weekly workshops. Speakers provide practical information to women about a host of issues they will encounter during their project and beyond. Topics include how to write an abstract and a press release for a research project, building a professional network, business etiquette, "Gender Bias in STEM Disciplines: Developing Effective Strategies," and "Women in Leadership." "It was a great experience to be exposed to research," Schultz says. "One of the best things was that, going from my freshman to sophomore year, I had an opportunity to do research. I don't think many undergraduates have that opportunity." One of the concerns of Anant Kukreti, the director of engineering outreach in the school of Energy, Environmental, Biological and Medical Engineering at UC, is the lack of women teaching at the college level, thereby resulting in a dearth of strong role models. "In the teaching profession (in STEM fields) there are very few women faculty," he says. "And not only that, the few that we get, we are so unfriendly to that they leave. These students are seeing all this." Kukreti is unwilling to divulge the negative experiences of his female colleagues at UC, but he isn't shy about expressing his dismay with the fact that the engineering school in particular allows such an unwelcoming work environment to exist. He observes the administration staff talking about the need to recruit women and other minorities but taking no effective steps to recruit that demographic, let alone trying to understand how the existing culture needs to change to create a cohesive and effective teaching staff. Believing that most men are oblivious to the impact their inappropriate views and behaviors have on the health of STEM professions, Kukreti is frustrated by the benign neglect of the institution, which allows the misogynistic practices to continue. "They have started having the conversation at a very rudimentary level, but still it's a very male-dominated profession, and I don't think they realize the seriousness of the depth of it. It's not a conversation in earnest," Kukreti says. "Particularly in engineering, where you don't have women faculty members, how do you compensate for that? How can we provide mentors to our women students?" Participation in the Mentornet program is one way he tries to make sure female students have access to women in the profession. The website matches up minority students, including women, with a mentor in their chosen field of study who is not at their school and might even be out of state. The goal is to give women access to a mentor who isn't able to influence a grade or hiring decision so that they feel free to discuss any issues. After the match is made, Mentornet helps facilitate the relationship via regular e-mail communications, called "prompts," to both parties. "Our women students can develop a virtual relationship with a practicing woman engineer somewhere who they can talk to, get feedback. That is the least that you can do," Kukreti says. "Every year I have to fight for it. You're talking about $2,000 - $3,000 — look at the amount of money in comparison to ... 30, 40, 50 women engineering students who are very active participants in that. They have rave reviews, and here we're fighting with the university year-to-year to maintain that program." This makes it impossible for Ghia to collect data on actual outcomes. However, she can speak anecdotally because of students who follow up with her on their own. For example, a 2003 WISE participant recently sent an e-mail explaining that she is getting her Ph.D. and would like to address the current group during the weekly workshops. The twin goal of providing students with practical research experience and keeping women in STEM programs are achieved when the WISE research positions help students successfully compete for cooperative education employment (co-op) placements, internships, and even full-time employment after school. "Very often the work that they do translates into a journal publication, so they have coauthored a journal paper," Ghia says. "I got a call from one of the graduates. She got a job with Amgen, the biomed firm on the west coast. She said, 'I think the main reason I got that job is because I had this report.' "
Schultz believes her WISE experience helped her secure a co-op position. But she also values the more intrinsic benefits that can't be measured. "I was working with masters and Ph.D. students, so their knowledge was vast — the things I learned from them and the projects they were working on were really great," she says. "And culturally, I was working with students from China and Iran and Egypt and I learned so much from all of them." Schultz adds there were also a few women in the lab. "It wasn't just me surrounded by men all day."